This review was published in Blue Minaret literary magazine. Move over, Nancy Drew. There’s a new teen detective in town and she’s much more nuanced and layered than you could ever be. Introducing Asiya Haque, A Bengali Canadian girl whose main goal in life is to be normal. She’s got a lot on her plate: a mother whom every South Asian girl can recognize, a mosque community that’s as inquisitive and gossipy as one could possibly imagine, and a younger brother who’s a pain in the a**. All Asiya wants is to go to high school, volunteer with the local conservation group, and maybe even chat with cute newcomer Michael. But life has other plans for her, and when a dead body turns up in the woods, and Michael goes missing, she’s thrust into a mystery whether she likes it or not. What follows is a fun read, comic at times, serious as heck at other times, as Asiya is sucked into the situation in order to help prove Michael’s innocence. Only she’s not that sure he’s really innocent, or just preying on her to get what he wants. What a deliciously dangerous conundrum! God Smites may have an unusual name for the genre, but the novel itself is genre-bending in my opinion. It’s definitely a mystery/thriller complete with cops of uncertain loyalties, hostage situations in the woods, and cars trying to ram into the heroine to silence her. At the same time it’s something more: almost a literary undertaking with an attempt to bring South Asian and Muslim problems to the forefront. Asiya’s mom is so stereotypically obsessed with protecting her daughter from boys it’s hilarious in its truth. The mosque’s sermonizing Imam, the gossip-ready aunties, and the men who just want to be excluded from all the drama, are all characters so real you could touch them. You know these people, even if you’re not Muslim. They could be your neighbors, members of your church, your crazy relatives. Ishara Deen has written a fabulous book. It’s a long time since I read YA, but once I started I couldn’t put it down. The writing is great, something one cannot say of all indie authors, and it’s message is wonderfully received without preaching. It’s a lighthearted mystery, a heavy commentary on social immigrant issues, and a painful wait until the second book in the series, so that I can know what happened to the handsome Michael. 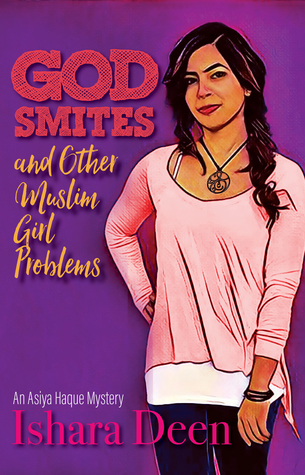 Sign into Goodreads to see if any of your friends have read God Smites and Other Muslim Girl Problems.